This is a portable digital inclinometer with LCD display. 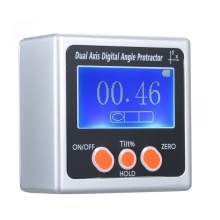 Easy to operate and use, great for accurate angle measurements. Support both Single Axis 4*90° measuring range and Dual Axis ±40° measuring range. It can be used in interior decoration, construction area, plumbing, floors & stairs, woodwork and other industries. Zinc alloy shell, strong durability and long service life. Absolute & relative measurement interchange at any position. Support both Single Axis 4*90° measuring range and Dual Axis ±40° measuring range. LCD display with backlight for easy reading of measurement data. The measuring data can be flipped, more convenient to read. Data hold function. Angle and slope readout conversion. Built-in magnets in measuring surface, it will conveniently cling to the metal measuring workpiece for easy measurement. Automatic power off in 3 minutes when not in use for saving power and extending battery life. Portable size, convenient to co-work with other measuring tools and enlarge measuring range. It can be used in interior decoration, construction area, plumbing, floors & stairs, woodwork and other industries. Powered by 2 * AAA batteries(not included), easy to install and use.